I'm traveling until the beginning of November. Please wish for me a safe and beneficial journey. Last year I defined the jewellery series I would make. They are basic guidelines, still giving me freedom in each individual piece and allowing me to evolve. 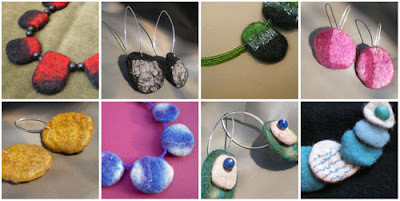 Pebbles series is made with my felted pebbles combined with glass or stone beads. 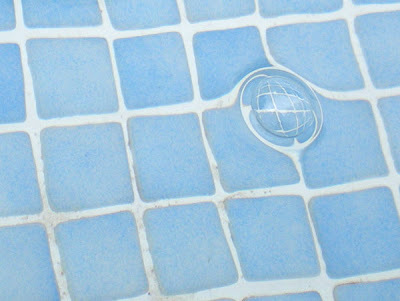 They can be beaded sideways or lay flat exposing the surface (Flat Pebbles). 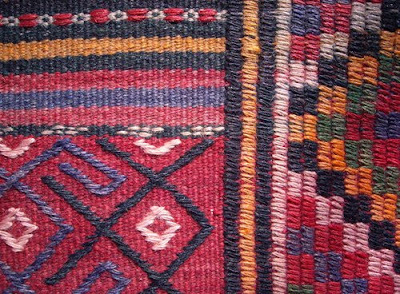 Cuadrados is the same but using cut squares instead of pebbles. 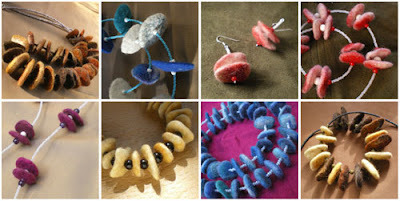 Felt Chip is made from woollen chips combined with semiprecious stone chips. 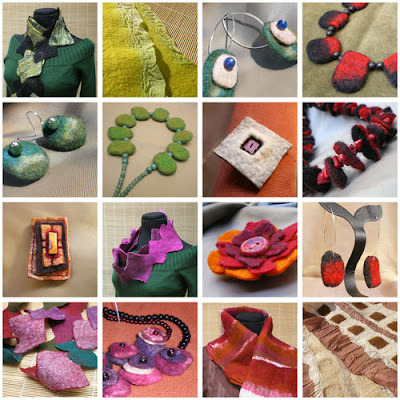 Textile Tender combines flat felt strips with beads and beading. 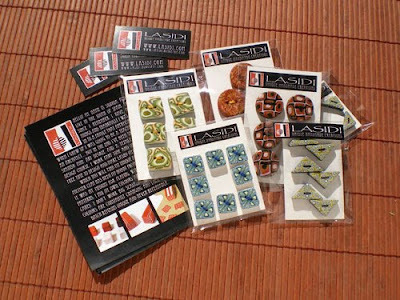 I had someone interested in my buttons for retailing in a fabric shop. That’s talking wholesale. I’ve already turned down two possible wholesale customers in the past year because I felt unprepared, my production is not big enough and my prices are not marked to allow such big discounts. I should stop doing this soon, I think I’m slowly getting there. If you blog and have a Facebook fan page, here is a nice way to save some time and keep up to date. Your Facebook page can import all your blog entries just by adding the notes application. This way your facebook page will automatically post your blog entries on all your Facebook fans homepage. 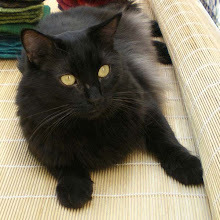 It’s usually called nuno felting when a fabric is felted in with the wool using the wet technique. The finer the fabric, the easier it is for the wool fibres to penetrate and attach. 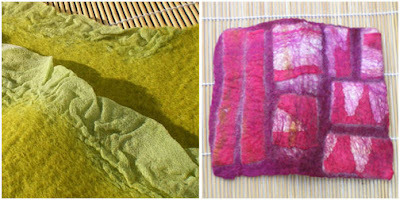 What is felt and felting? 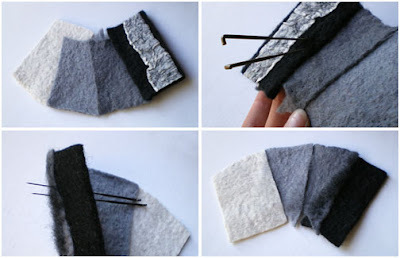 Felt is basically tangled fibres. It can occur naturally, given the time, but what we usually call felting is encouraging the fibres to tangle and stay pressed together. 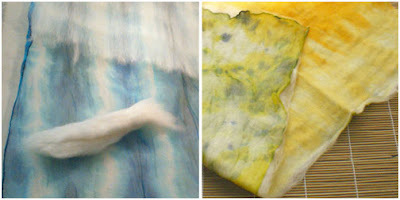 When working with wool there are two main ways: dry felting and wet felting. 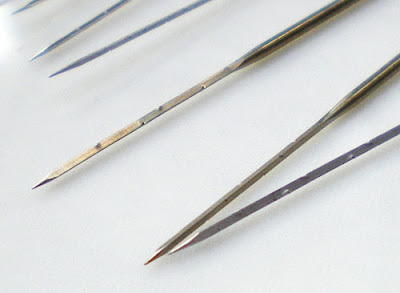 Dry felting is done with the help of special needles that pull the fibres when you poke. It’s also called needle felting. 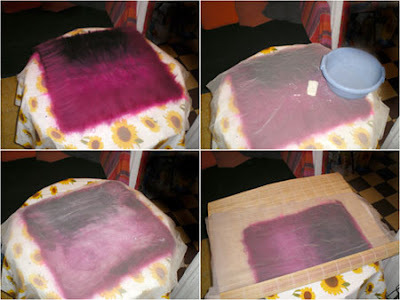 Wet felting encourages the wool to shrink and tangle by friction with warm water and soap. Wool is a natural fibre and it comes from sheep. It's their hair and just as we have different kinds of hair, so do sheep. The natural colours go from creamy white and greys to beiges and browns and it can be longer or shorter, very soft or quite ruff. 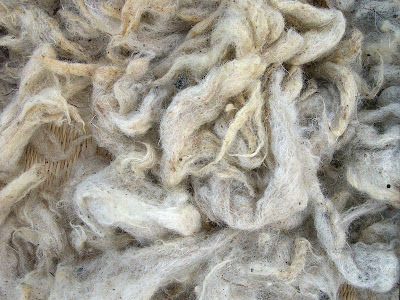 Wool is sheered off the sheep and then cleaned and usually combed to align all the fibres in the same direction or carded to make loose flat sheets. 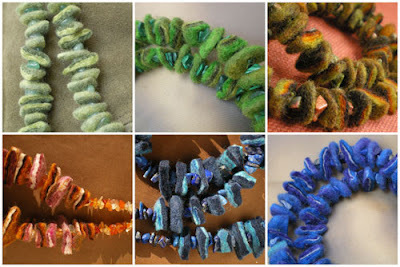 Among other things, it can then be felted or spun to make yarn. 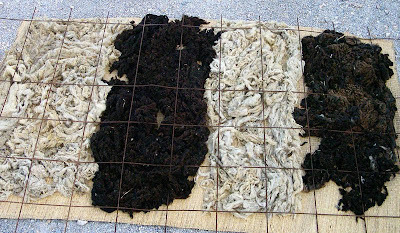 In these pictures the wool of four sheep has been washed and is drying in the sun. It still needs to be combed to align fibres and to get rid of some more countryside! This is local wool from close to where I live. Sheep here are bread mostly for cheese and meat. The wool is pretty ruff and usually ends up going to waste… so there I was to grab some! There is a funny little adventure story behind this wool, maybe one day I’ll tell you about it. Not been posting much but still here. Summer left suddenly and autum came with cold and rain and grey days... now the sun has come out again. For the last month and between quite a few social events and trying to have a little brake, I've been sorting out finished from unfinished felt (still triying to finish some more), making felted jewellery, finishing off flowers and making brooches, taking pictures of finished items when the sun is out and croping and cleaning them up mostly when the moon is out, listing new items in my shops, packaging and storing them and restocking up with supplies. I currently have a jumble of all those different stages... but no pictures to show you. I'll take some if the sun stays out. I still didn't get my polymer clay out, but I impecably cleaned up for it. I need to get started, I'm supposed to make a piece for that exhibition... I should also make more buttons and a new batch of jewellery. 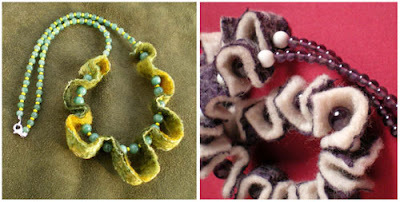 I want to make some clay pebbles to include with my felted pebbles. I have to update my gallery. My good bye summer picture.